Love your TV shows? 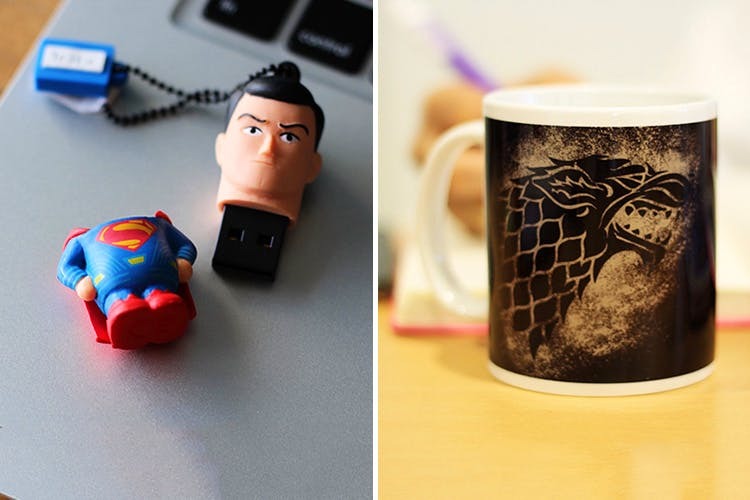 Whether you're a die-hard GOT fan or you know every episode of FRIENDS by heart, Epic Stuff is doing some incredible merchandise based on our favourite TV shows and movies. Their team knows how it is to go absolutely nuts over a show or movie series (Potterheads and Star Wars fans, there's stuff here for you too). It''s not just any stuff like posters and badges, but really cool stuff that comes in handy on a daily basis. We're loving their USB flash drives, notebooks, cushion covers, wall clocks, pendants, earphones and more. We're loving their Minion and Marvel themed pen drives (who wouldn't want a Batman or Wonderwoman on their pen drive?). We've listed a few of our favourite shows and the stuff they're doing based on them. You could get the Undesirable No.1 poster on your wall, or the cushions of Gryffindor and Ravenclaw on your couch. They've got themed diaries, wall clocks, badges with the house crest on it, pendants with Hedwig and Harry's signature glasses and scar on them and so much more. We like the cushion covers and the diaries, but our favourite has got to be the hanging wall clock from Platform Nine and Three Quarters. It seriously looks like the real thing. As the final battle approaches (and we all desperately wait for the next season to come out), it's time to pick your allegiance! Are you with the Mother Of Dragons, the King Of North or with the Hand Of The Queen? They've got mugs, t-shirts and notebooks for different characters and the different houses. We're definitely hoarding everything from The North, T-shirts, mugs and posters, we're ordering it all. You've obviously been living under a rock if you haven't heard of FREINDS and if you've watched it, you know it's hard not to love. They've got the whole gang on notebooks, mugs and group shots if them on clocks and t-shirts. We love the doormat with How You Doin written on it and the Central Perk notebook. Know a die-hard FRIENDS fan? You know where to order their birthday goodies from.